OVER-SPENDING on healthcare is posing the biggest threat to our economic recovery, the European Central Bank has warned. Health Department expenditure – already €49m over budget three months into the year – needs to be reined in if our recovery is to stay on track, it said. Ireland is also vulnerable to international trade issues – but health spending is the one area singled out as problematic in the ECB's annual report that the Government has direct control over. If that level of spending continues, the department could find itself in a similar situation to last year when it needed a €200m mini-bailout from the Exchequer. "Looking ahead, Ireland needs to address the remaining fiscal vulnerabilities, especially in healthcare spending, and to continue to comply with its fiscal targets in order to provide a positive signal to markets," the ECB said. The warning is contained in the bank's annual report which includes its first update on Ireland since the bailout ended in December. The focus on health spending echoes similar concerns that were raised back in November in the final report of the troika before the bailout ended. "Health spending is the biggest risk in terms of the elements that the Government here can control. It is down significantly year on year but did run ahead again in the first quarter," according to Dermot O'Leary of Goodbody Stockbrokers. Health spending is high here relative to other countries, he noted, but he said the numbers reflected the impact of high unemployment, which means more people have a medical card. As the number of people in work improves it should feed through to health spending, Mr O’Leary said. Along with the EU and IMF, the ECB was one of the three international lenders that made up the troika, which oversaw the bailout. In its annual report, it praised the Irish bailout exit as it “underlines the success of the necessary, but sometimes painful, measures”. Indicators at the end of last year suggest “a further strengthening in activity” in the economy. And despite some suggestions that the straitjacket imposed under the bailout could be relaxed, the ECB stresses that it is “crucial for Ireland to continue implementing the necessary reforms”. 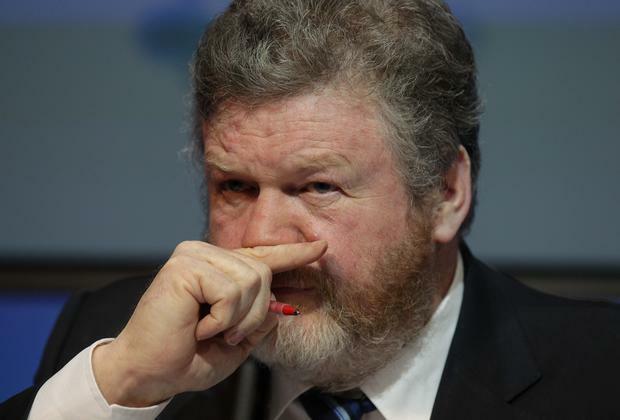 The Government is expected to cut around €2bn in next October’s Budget. Bank reform in particular is needed in “order to safeguard market access and its long-term economic prospects”. Elsewhere in the report, the ECB said it was not consulted by authorities here ahead of last year's promissory note deal to shut down the former IBRC and replace its debt to the Central Bank with long-term government bonds. It's listed among 21 cases of non-compliance by 17 eurozone members which had an obligation to consult the ECB on relevant legislation. The ECB said it understands the reason for the failure was the “urgent nature of the situation”.